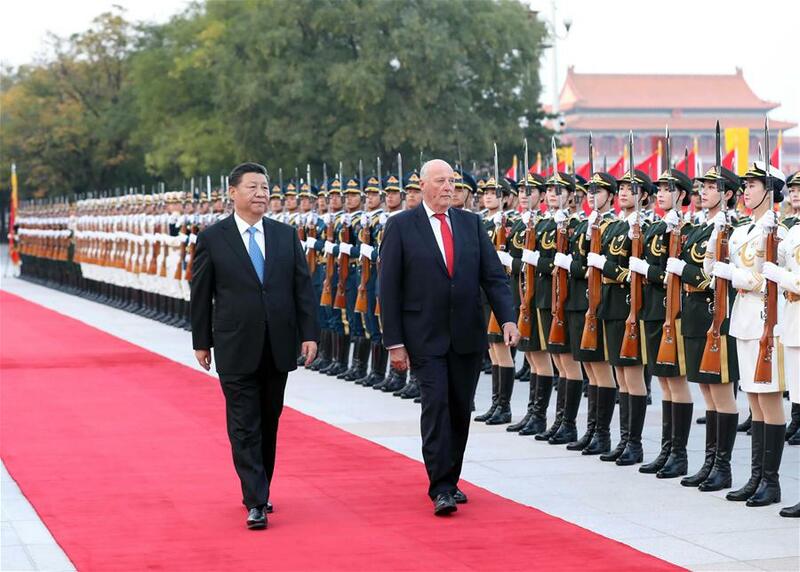 BEIJING, Oct. 16 (Xinhua) -- Chinese President Xi Jinping held talks with visiting Norwegian King Harald V in Beijing Tuesday, and they agreed to inject new impetus into the development of bilateral relations, and write a new chapter of the traditional friendship between the two nations. Xi expressed his appreciation for Harald V and the royal family's long-term concern and support for the development of China-Norway relations, lauding their important contributions to promoting friendship between the two countries. "Promoting the sustainable, sound and steady development of China-Norway ties is in the common interests of the two peoples and corresponds with the trend of the times featuring peace, development and win-win cooperation," said Xi, adding that fruitful results have been made since the normalization of bilateral ties in 2016. Noting that Norway is one of the first European countries that have recognized the People's Republic of China and China's market economy status, Xi said next year will mark the 65th anniversary of China-Norway diplomatic ties, and China stands ready to use this opportunity to open up a better future for the bilateral relations. "The two sides should continuously consolidate and enhance political mutual trust, stick to the principle of mutual respect and equality, and fully respect and earnestly accommodate each other's core interests and major concerns, so as to lay a solid political foundation for the steady and long-lasting bilateral relations," said Xi. The two sides should continue to deepen and expand pragmatic cooperation in various fields and work out a comprehensive arrangement for the two countries' economic and trade cooperation, so as to achieve mutual benefit and win-win cooperation on a higher level, stressed Xi, noting that China looks forward to cooperation with Norway under the framework of the Belt and Road, with a view to jointly promote connectivity on the Eurasia continent. Xi said the Chinese side welcomes Norway's experience-sharing and assistance in the preparations for the 2022 Winter Olympics in Beijing. He also called for closer cooperation between the two countries in international affairs and communication and coordination within multilateral frameworks such as the United Nations. "The two countries should jointly promote economic globalization, advocate global multi-polarity, safeguard multilateralism, sustainable development and world peace and stability, and promote global governance in a fairer and more reasonable way." Xi said China is willing to enhance exchanges and cooperation with Norway under the framework of the Arctic Council, and hopes that Norway will continue to play an active role in the sound development of China-Europe relations as well as China-Northern Europe cooperation. For his part, Harald V said he was glad to pay the state visit to China again, hailing the rapid development and great changes in China. He said the visit was also an indication that Norway-China ties have come back to the right track and once again shown strong vitality. Harald V said the two countries should work together to expand mutually beneficial cooperation, and that Norway stands ready to enhance communication and cooperation with China in the field of winter sports and supports China's hosting of the 2022 Winter Olympics. The heads of state witnessed the signing of several documents on cooperation after the talks. Prior to the talks, Xi held a red-carpet ceremony to welcome the visiting Norwegian King. Earlier on Tuesday, Li Zhanshu, chairman of the Standing Committee of the National People's Congress, also met with Harald V, calling for more cooperation between the two countries' legislatures.